Potato Salad, Coleslaw, Leafy Green Salad & our Desi Kachumber. 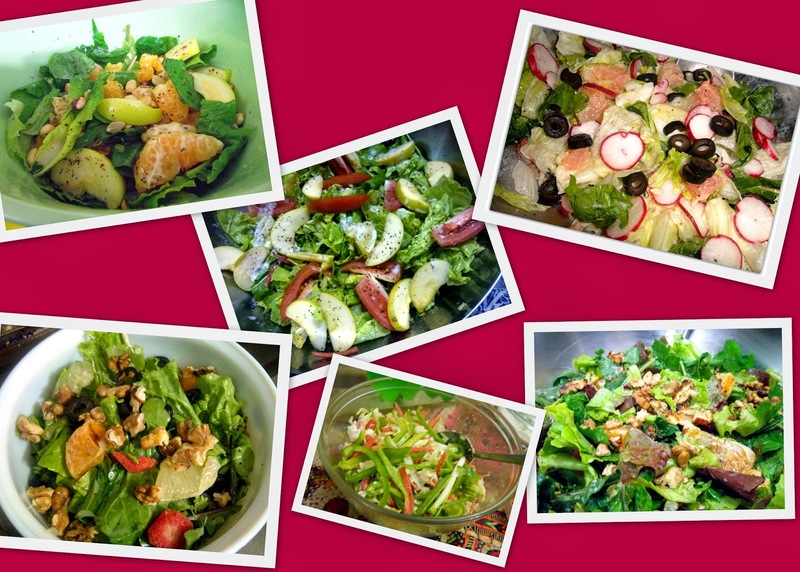 They all taste fundamentally different but all these salads have one thing in common and that is ..... The Dressing. The dressing whether its as simple as olive oil and lemon juice or as complicated as homemade ranch dressing with about 10 ingredients is what brings the salad together and makes it delicious! My recent interest in salads (evident from those following me on Facebook) was a result of a chance phone call from Sungold Organic. The owner had made a call to follow up and inform me about the variety of salad greens available in winter. And errrr, I got a bit too excited and ordered about 6-7 kg's of vegetables. In my defence - they had SO much stuff available - 3 to 4 different varieties of lettuce, chinese cabbage, rocket, baby spinach etc etc; plus it was organic, reasonable AND they offered home delivery. Once the bag of vegetables came and I realized how much I had ordered, it was time to hit the books for a salad how-to, prompting me to start these salad 101 posts. While I was doing my reading up and realizing how much I didn't know, I decided to start putting all the knowledge I gained through experimentation and books and google on Facebook and the blog so all of you can benefit. The Salad 101 is going to start off with salad preparation (cleaning, storing, tossing), types of different salads, and complementing dressings.However, please feel free to make substitutions because everyone has their own preference - more greens, less greens, no tomatoes, yes tomatoes, more dressing, no dressing, homemade mayo, store-bought mayo and so on and so forth. Just remember, its your house and you can adjust as much as you want to! That is exactly what I did - I would first taste the vegetables, then start on making the salad, and keep on getting feedback from my family till I figured out the balance. Starting off with leafy greens, since they are in season and the most common salad type as well. The first step in making any salad is cleaning the greens. Put the greens into a salad spinner or in a colander inside a large pot. Fill the pot with water and swirl the greens around with your hand. Now lift the colander or salad spinner bowl out of the water. Pour out the water, and repeat as necessary till there is no dirt-residue remaining. Do not run water directly from the faucet onto the greens as the force of the water will bruise them. When the greens are clean, spin them dry in a salad spinner or pat them dry with towels. I wash them in a colander, shake off the water, then layer a plastic tray with kitchen towel. I spread a layer of greens on top of the kitchen towel, and then put another layer of kitchen towel on top and pat it dry. Depending on the number of greens, I make about 2-3 layers which dry up in about the time I have the rest of the ingredients ready. Greens must be quite dry; otherwise, the vinaigrette will slide off the remaining water and the salad will taste watery. Unwashed greens should be carefully stored in the refrigerator, making sure that they are not tightly packed as that encourages rotting. Washed greens can be stored in the salad spinner. Line the salad spinner with paper towels, then layer in the greens covering each layer with more towels to store for up to 2 days. If you don't have a salad spinner, loosely roll the greens in paper towels and then place them inside a large zip-lock bag (making sure not to pack too tightly) and place in the refrigerator. The next how-to is going to be on tossing greens and adding dressing, followed by a type of salad greens available and then recipes! Salad Spinners are available at JB Saeed (linked below) in Karachi and should also be available at other places.